Amazon on Tuesday greatly enhanced its Cloud Player service with new scan and match technology, competing with Apple's own iTunes Match. Amazon promises that its Cloud Player now offers users faster music import using scan and match technology. Matched files are also upgraded to 256-Kbps-quality audio. Future Amazon MP3 purchases are automatically delivered to a user's Cloud Player, and eligible past Amazon MP3 purchases are also delivered without having to import them. Amazon Cloud Player also offers users the ability to edit song and album information, including tracks and title numbers. It also gives the ability to import information for matched files directly from Amazon's catalog. Users can import up to 250 songs fro free in Cloud player, or subscribe to Cloud Player Premium for $24.99 per year and import up to 250,000 songs. That's the same price per year as Apple's iTunes Match, but Amazon's service offers considerably more songs than the 25,000 cap on matched songs through iTunes Match. Amazon launched its cloud-based music service for the Web and for Android devices last March before Apple publicly unveiled iTunes Match. Previously, users had to upload their songs manually to use the service, while Apple's iTunes Match introduced the ability to match locally stored songs with copies available for sale on iTunes. In addition to adding the new matching feature, Amazon also has a Cloud Player application for iOS that launched in the App Store last month. 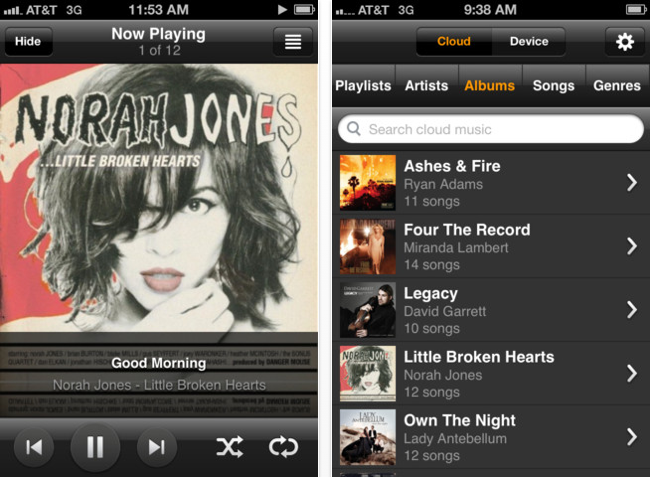 The "Amazon Cloud Player" application is a free download for iPhone.